If you want to watch Hereditary, please consider renting or purchasing the movie through this amazon link to help us support the podcast. If you haven’t seen Hereditary, and you are reading this, STOP! Watch the movie. It’s available to stream on Amazon. You should go into this movie knowing nothing about it. I say this with certainty because I went in to see Hereditary without knowing a darn thing about it, and it was a transcendent experience. I didn’t know it was a horror movie; I didn’t know it was about interpersonal relationships, I didn’t know anything. That’s a slight lie; I knew that the movie had a very disturbing scene that polarized viewers and made many walk out of movie theaters. Ari Aster, the director, has made a masterpiece. I go into most movies knowing almost nothing about them. I don’t seek out trailers. I don’t look for release dates, which has had to change a little bit given the launch of this site and the podcast. I went into this movie knowing nothing, and it made for the wildest ride I could have possibly imagined. The build in tension, the crumbling family relationships, the fact that you can see and understand every major character’s point of view even though they are wildly conflicting – this movie is a high water mark in horror and for cinema in general. Hereditary will be so uncomfortable for some that they will generally find it distasteful. This is not a jump scare horror movie. This is an Exorcist, a Rosemary’s Baby, a Psycho. There is so much to this movie that one watching isn’t enough. Everything about Hereditary is intentional and of the highest quality. The writing, the characters, the acting, the sets, the tension – it’s all great. The more I watch it, the more I realize how rich the world that they have crafted is and how it turns Hereditary into an experience instead of just another movie. I’m not going to go in-depth with the spoilers here because it just wouldn’t do the movie justice. There is a version of this story that I think would make a powerful novel, but so much of the integral parts of this movie are based on visual keys and clues that I think that film is where this story was meant to be. If you want spoilers on this movie, listen to our podcast, we will be diving deep on this one. The story is centered around Annie (Toni Collette), her husband Steve (Gabriel Byrne), son Peter (Alex Wolff), and daughter Charlie (Milly Shapiro). It starts following the death of Annie’s mother, who as it turns out was controlling and terrible to her family. Toni Collette is a tour de force in this movie. Her acting is so impressive, her emotions so raw that you really can’t help but empathize with her even when she is clearly circling the drain and moving toward a mental break. There are two reasons Hereditary is so effective the first of which is it primarily focuses on a normal family unit, who thanks to circumstances beyond there control, is thrown into extreme strife. Everyone has faced familial issues, but the ones in this movie are your worst nightmare – the things you hope never to have to experience. The second reason Hereditary is so effective is that despite that fact that each family member is essentially pitted against the others, you can see all of their points of view very clearly. As a viewer, you understand and empathize with every family member in this movie. You have experienced every niggling bit of anger, guilt, love, and miscommunication that Hereditary throws at you. You’ve been the guilty son or daughter, you’ve worried about your kids or family members, you’ve hated them at times and felt the guilt that hatred brings. As a horror movie, Hereditary starts out as a single note of dread in an echo chamber – slowly, the note builds in volume and is joined by more notes until you are overwhelmed. 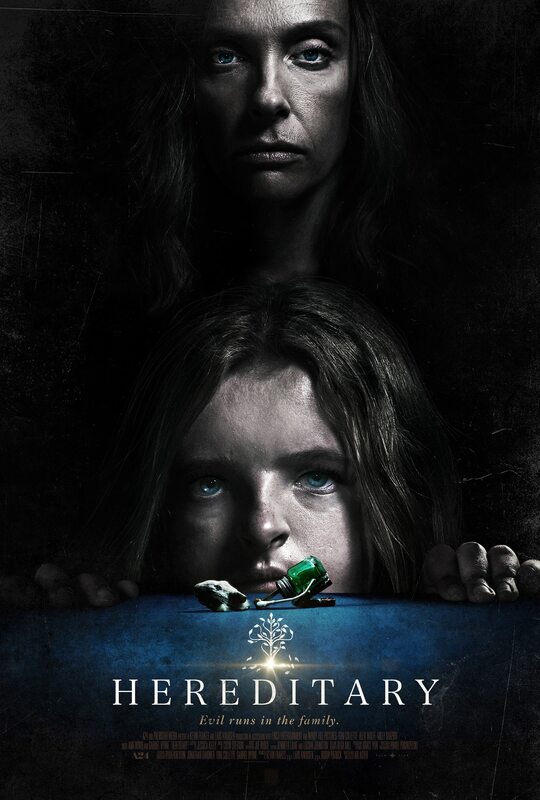 If the title weren’t “Hereditary,” it could have easily been “Dread.” There are no real jump scares. Instead, it relies on tension, time, and toying with your emotions to achieve something far more effective – something that sticks with you for weeks after watching. Most modern cinematography has ditched the long, well-crafted panning shots in favor of cuts and close-ups. In this movie, you see a bit of a return to the well-crafted scenes and long panning shots that made movies like Psycho great. Let’s put it this way. A large part of the reason this podcast exists is that of the energy that Hereditary gave to Bryce and me. We saw it with Bryce’s friend Kevin whom I had met minutes before the movie started. After the movie, which was the late showing, we saw fit to sit down at a bar and have drink so we could discuss this movie. Every time I saw Bryce after that, we couldn’t help but gush over how it was still in our heads. At this point, I’ve hyped it too much, which is what I tend to do. I’ve shown this movie to a few people, and not everyone agrees with me on it. As always, let us know what you think about Hereditary in the comments section, or on social media! Special thanks to Simon Morkvenas for editing this episode out of the kindness of his heart.